“Farmer owns the land! He has an asset that economically appreciates every day then why he must be looked down? What is the need to commit the suicide? Farmer only needs a farming model that makes his farm self-contained and brings in money every day. 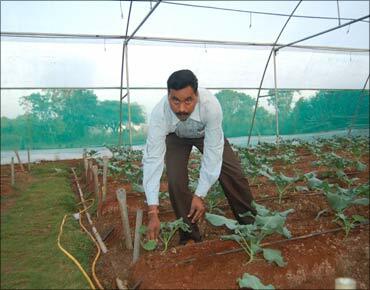 With just one acre of farmland it is possible to earn minimum Rs. 30,000 per month, sufficient to maintain a decent lifestyle in a village,” assures Mr. Dnyaneshwar Nivrutti Bodke, Founder, Abhinav Farmers Club. “We have created one-acre business model that would have shade net in 1000 sq meter for growing exotic vegetables, 3000 sq meter for cultivating Indian vegetables, one desi cow and two neem trees. This farm is managed by a farmer couple and requires 2 hours work in morning and 2 hours in evening. Additionally if the couple is interested they can grow dwarf variety 60 fruit trees (12 varieties fruits grown in 5 numbers) on three sides of the farm. With desi cow they can sell minimum 5 liter milk every day and sell Indian and exotic vegetables alternate days. In this way they will be surely be able to earn minimum Rs. 800-1000 every day. Rest the fruits will bring in the bonus income. All the produce is sold to the end consumers directly. With neem leaves, farm waste, cow dung and urine all farming inputs are prepared within the farm so expenses are reduced. In this way farmer becomes self-reliant and earns stable income through which he can take care of his family very well,” Mr. Bodke elaborates the farming model prescribed to the farmers in the groups formed under Abhinav Farmers Club. Abhinav Farmers Club was started in 2004 with just 11 farmers in Maan village, Pune district, Maharashtra. The club was conceptualized by Nabard while all the operational responsibility was on the shoulders of Mr. Bodke. “Nabard gave assistance for many years and continues to support as required. We members worked on our farms as farmers but used to think and act like businessman for procuring farming inputs, marketing and selling our farm produce. We together solved all the problems and stood united. Consequently we started earning profits by selling our farm produces directly to the end consumers. Slowly and gradually the system got standardized. It was an instant success and since then there is no looking back!” he affirms. At present the club has 327 groups across the country. Maximum groups are in Maharashtra while others are in Telangana, Andhra Pradesh, Madhya Pradesh, Rajasthan, Karnataka and recently a small group has been formed in Nanital, Uttarakhand. “Initially a group is formed with 15-20 farmers and later they increase the members based on the capacity and operational efficiency. They collectively sell organically produced A2 milk, vegetables, fruits and grains. Usually farmers with small land-holding are preferred, having 1-2 acre farm. When the group is formed the charter members are given three days residential training as how the group works. They are trained on every aspect from procurement till sales. They are encouraged to take up hi-tech farming and automation,” he informs. There is no fee to be paid by the farmers for being part of the farmer group under the club but few requisites to be followed are, farmer must be engaged in organic farming, should be a land owner and committed to his group members. All the produce of the farmer group is sold to the consumers directly. Products are sorted, graded and packed before delivery at the customer’s door step. This work is done by women self help groups. “To look for the direct sales market, we approach residential societies and educational institutes. As the products are priced same as chemically produced commodities and quality is superior we establish long-term contacts and get repeat orders through word of mouth publicity,” he shares. There are also some special groups in the club that are formed based on the products such as in Ratnagiri district they have mango growing groups, Sholapur has jowar growing group, similarly for other fruits, grains, etc. “These groups deal in bulk quantities sold to B2B customers and the farmers have more than 5 acre land holding,” he informs. Mr. Bodke and his team utilizes latest technology to best of their advantage. Recently they have created ‘Lokacart’ app to stay connected with all the farmer members. “This has strengthen our network and facilitated the communication thereby transparency is increased. For example, the group leaders discuss and fix the common selling price for different products like pure A2 milk and it is uploaded on the app. The update reaches all the farmers within fraction of second,” he highlights. Number of farmers associated with Abhinav Farmers Club multiplied consistently. “They are satisfied with the monthly profits earned thus continued their association with us. Now their children are grown up and have attained professional degrees. Majority of these children are working with us in different ways. Some of the boys and girls having mechanical engineering are working on low-cost and high performance farm machinery, BSc graduates manage our ‘Lokacart’ app, develop natural bio-solutions for plant protection and so on. As our next generation is enthusiastically and willingly working with us we are extremely happy,” he asserts.